This facial tonic refreshes and cleans the skin deep within the pores. The high content of Panthenol, Proline and the high concentration of Hyaluronic acid allows for the ideal “pre treatment" and preparation for the SkinIdenttreatment to follow. 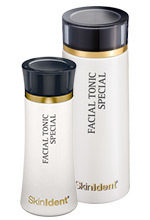 FACIAL TONIC SPECIAL is perfectly coordinated with the SkinIdent CLEANSING MILK SPECIAL. Please always use these two products together so that you can enjoy the synergizing effect of both products to your skins fullest advantage.